My parents are redecorating their house. So what? I hear you say. Yawn. Quite – I shouldn’t be bothered by this minor event. If anything I should show a little excitement for them, be hopeful that the experience doesn’t prove too stressful. But I can’t help feeling a little put out, somewhat sombre. Because it means the final goodbye to my old bedroom. Yes, I know – grow the hell up, Gemma. And yes, it might have been a good few years since I could credibly claim that room as mine. But I think we can all agree that a childhood bedroom isn’t just a bedroom – it’s a whole world. A sacred sanctuary in the tumultuous experience that is ‘growing up’. The passion those walls hold – they are so brave, so bold, so revealing. They reflect the ‘you’ that you aren’t quite yet able to be in the outside world. This is the place you allow yourself to be honest about your dreams and desires – about yourself – in a way you’d never dream of doing with those around you. Your parents watch you grow up through those walls. Look for clues to help them unravel what’s happening to you, to learn new things about the person you are becoming – otherwise impossible, since you stopped talking to them. Communicating only in grunts and through the lyrics of terrible music turned up tortuously high through hi fi speakers. I am reminded of a surprisingly powerful film that explored the strange worlds of Depeche Mode fans around the globe, made by British filmmakers Jeremy Deller and Nick Abrahams in 2009. In Russia and countries of the former Soviet Union the band’s music has been treasured ever since it was available in the 1980s – only on illegal bootlegged cassettes. With an equally massive, but secret, fan-base in Germany the band’s music formed the soundtrack to the march to freedom as the Berlin Wall came down. And it all started in the bedrooms. And so whilst I am (apparently) grown up, I still feel more of a connection to that room than simply using it as a space to stand in and talk to my Mom as she folds up some washing. It’s been torture, this whole extraction process. First, in 1996, they installed net curtains. There was the first gentle nudge. But I’m not a fast mover – 14 years later I finally leave home but, although I remove my physical self, my ephemera remains firmly put. Don’t even think about it, that stuff said, I am still Gemma’s property. But my parents are clever. They bided their time wisely – for the socially acceptable number of 5-years – before deciding right, that’s it. She’s definitely not coming back, ever, and we are claiming our room back. And although my stuff would remain in the room they used the space for something else. Primarily, to fold washing in. They packed up my stubborn ephemera into bags. Left the bags loose about the room – hinting. I didn’t take the hint… 18-months later I was asked to take the bloody stuff away. Humph. The CDs were the first to go. Then my posters had to come down from the walls – and that was the most harrowing moment. I collected my wall contents in solitude, just me and my room alone again, as though I was conducting some kind of ritual. The ritual of letting go. 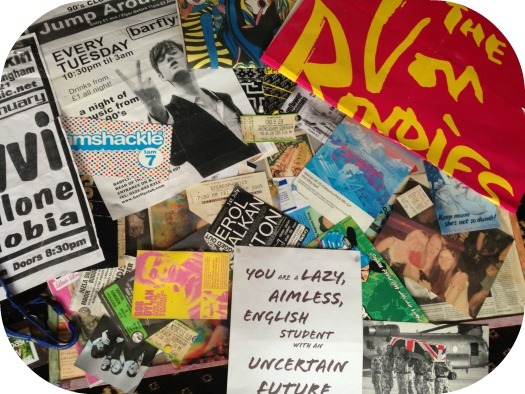 Band posters, postcards, gig tickets, train tickets, club night flyers – it all came down and, because I couldn’t bear to throw it away, my wall now lives in a bag in a dark cupboard. I wouldn’t want to display those things now, because they no longer reflect me – but that doesn’t mean I want to forget that girl. This wall is like a photograph album, and more personal than any diary I ever kept. And, this week, the last step. Mom and Dad have decided it’s not appropriate to have bright purple walls and a lurid green ceiling in an adult house, hence the total redecoration. Fair enough. At least they’ve gone to the extreme pretence of claiming to need to redecorate the whole house rather than just my room. But I am dreading going to see it. With that last bit of me gone my imprint will cling no longer. Despite the angst, I do feel lucky. I had a very stable upbringing – literally, we never moved house once. And so no wonder I feel such a connection to that space. I wonder who used that room before I claimed it as my own in 1983? Did it once belong in another child’s heart? Were they forced to leave it for a new bedroom, a new home? If you have more than one childhood bedroom do you have one that is truly yours above the others? It made me laugh and cry taking apart that room. But at least I can still return to it in my mind (and well, in my drawer). And who knows, maybe one day I’ll resurrect it somewhere else.